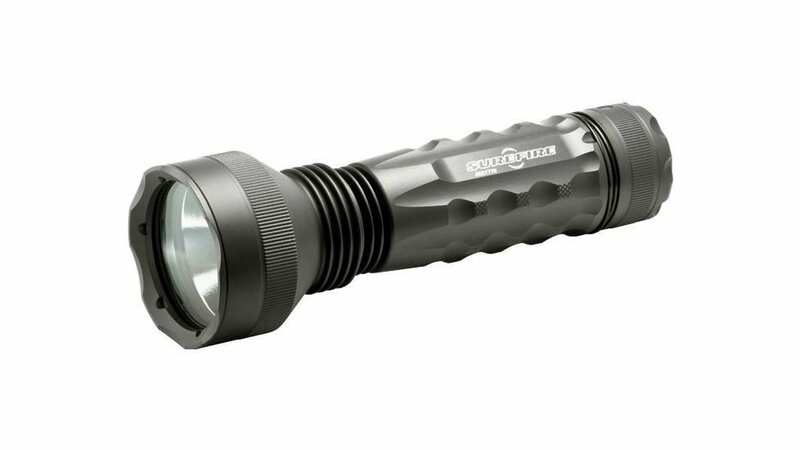 The M6LT Guardian—a powerful LED upgrade of our incandescent M6 model—is a long-running extended-range flashlight featuring a tight 1,200-lumen beam focused by a 2.5-inch Turbohead TIR lens. The brilliant white beam can dominate potential aggressors by overwhelming their dark-adapted vision, or it can reach far into the night as an amazingly effective spotlight/searchlight that fits in a coat pocket. The M6LT's high-strength aerospace aluminum body has deep machined grooves to provide a secure hold with cold, wet, or gloved hands, and is finished with Mil-Spec hard anodizing for excellent corrosion and abrasion resistance. The tactical pushbutton tailcap switch provides secure, ergonomic activation control: press for momentary-on, twist for constant-on. The M6LT is powered by six high-energy 123A batteries held in an easy-load battery magazine. **Runtime (at highest setting for multiple-output lights) until output drops below 50 lumens.